NEW YORK (CNNMoney.com) -- Google is investing in a new wind farm power grid to be located off the East Coast of the United States. "We just signed an agreement to invest in the development of a backbone transmission project off the Mid-Atlantic coast, that offers a solid financial return while helping to accelerate offshore wind development -- so it's both good business and good for the environment," announced the search engine company in a blog on Monday night. 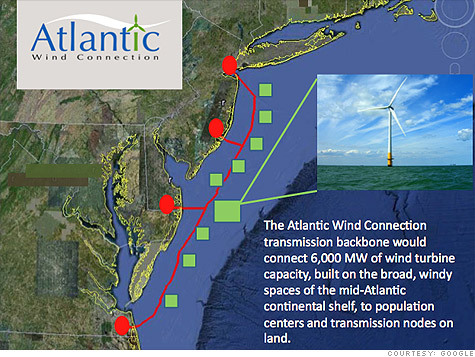 Google (GOOG, Fortune 500) said the Atlantic Wind Connection will be located at least 10 miles offshore and will stretch 350 miles from New Jersey to Virginia. The wind farm will be capable of producing 6,000 megawatts, enough to power nearly 2 million homes. The wind-generated power will be delivered to the land-based transmission system via subsea cables, the company said. Google is partnering with Trans-Elect, a transmission company, Good Energies and Marubeni Corp. to build the project. Google said it is putting up 37.5% of the starting money. Google spokesman Jamie Wood said the seed money will total "tens of millions" of dollars, just to get the approval process underway to begin construction in 2013. At that time, a much larger round of funding will be required to continue paying for the project. "This is a project that long term is going to be in the billions of dollars, once you look at all the construction costs," he said. Wood said the first section to be built will be from northern New Jersey to Delaware. Melinda Pierce, lead lobbyist for the environmentalist organization the Sierra Club, said this "truly audacious plan" is exactly what the Eastern seaboard needs. "This brings energy development and energy transmission offshore, away from where it's visible, and it's clean," she said. Pierce said this would be the first project of its kind in the U.S. -- connecting wind farms on a grand scale and delivering the energy to the power grid. So far, none of Google's partners have responded to inquiries. Google plans to release its third-quarter earnings results on Thursday. Analysts expect the company to report a 20% surge in revenue, to $5.2 billion, and a 14% jump in earnings, to $6.69 per share.